Sunshine (and an apple) . . .
. . . glorious sunshine. Hasn't the weather been fabulous? Such a shame I was working for the bulk of it but have made up for it today. So the only card I've made was this one which I knocked up last night after work (I like to craft late at night, thank goodness for daylight bulbs - be lost without mine). 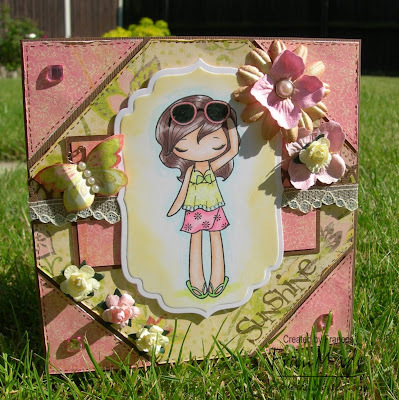 Finally inked up one of my Miss Anyas 'rain, snow,shine' set (had to be the shine one obviously) and even she wanted a little bit of sunshine and was photographed outside! 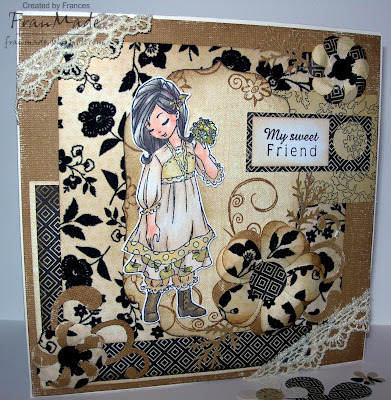 I've used a few challenges; the sketch over on Friday sketchers, colours lemon, pink sorbet and choc for colour create, pearls for ABC challenge and lace for spoonful sugar. I'm sure there was a challenge for flowers too but I can't remember where I saw that, so will leave it! 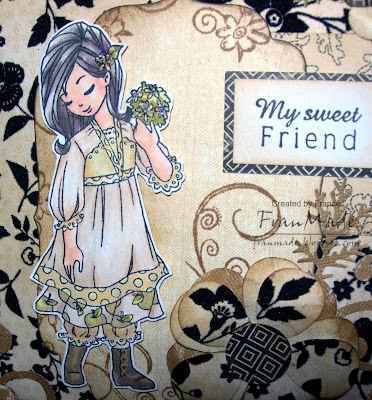 Colouring: Miss Anya stamped with black memento ink and coloured with Copics. Added stardust pens to rims of her glasses and glaze pen over the glass. Edges of the image was inked with yellow chalk ink whilst the nestie die was still on so you get the white border when you take it off - wanted it to look like she was basking in sunshine. 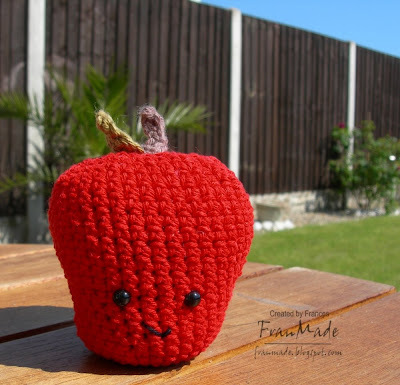 Whilst outside enjoying the sun I've made my first little Amigurumi stuffed toy. It's either Rosie or Adam (. . Apple, haha, get it?!) can't decide if it's a boy or girl yet . . . It's only my 2nd attempt at the old crochet so is very simple but I think it turned out cute (he/she's only about 2.5 inches tall). I got the pattern from here (free, just need to register) and I adapted it by making my own stalk and added eyes and a mouth! Hubby reckons I should have put the eyes higher up but I thought it looked cute where it was, what do you think? Weather's been absolutely gorgeous but did manage to make this last night. 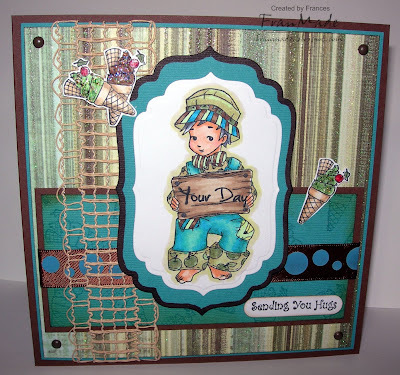 The layout is from Nikki's sketch over on 'Stamp with Fun' and the colour combo of blue & brown over on WoJ (o.k with a bit of green as well but it's a blue-green!). Love this Oakley, don't you think his hat is so cute and the sign is blank so you can put whatever message you want in it. Mine is from a Greeting Farm set. As for the WoJ ice cream - yum! I've used it to stamp all over the blue cardstock with a dazzle versamark pad, think you can just about see bits of it and then cut out and coloured 3 to use as my emebellishments rather than flowers (masked and stamped 2 together to go in the top corner and then a single one bottom right). It's another lovely day today but it also looks like the dreaded hayfever season has started for me - itchy and sniffling as I type waiting for the tablet to kick in. Luckily I only seem to have allergy to certain types and seems to be whatever it is that pollinates early on in the season (trees I think) so just wish they hurry up and get it over with :/. Right, off to do a bit more crochet (think you may be seeing some more cute crochet things on my blog soon now that I've discovered a whole new cute world of Amigurumi patterns - Japanese craze of making little stuffed crochet toys and things - totally useless but very cute and I think can become very addictive as it's nice and simple and quick). Enjoy the sunshine whereever you are! CCT this week wants to see some bling. Unfortunately, that's one thing that just doesn't come across in photos so you'll have to take my word for it that my card is super sparkly and blingy in real life (not to mention very 3D). I've blinged up the balloons, dusted pearl ex around image, have used pink blingy cardstock and to top it all, 3 square gems for good measure! 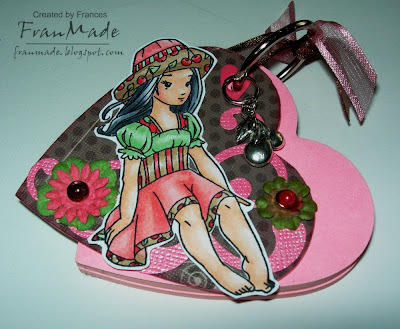 Here's a side shot of Susie to show you how 3D she is -I stamped her out 4 times and decoupaged her. 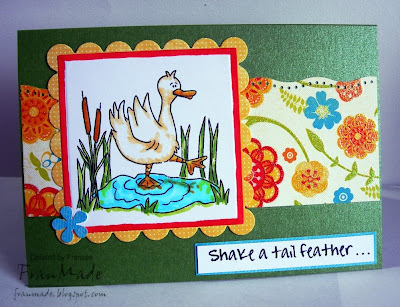 Also, if you like making ATCs and would like to be a guest DT for the month of June hop on over to T & F and leave a comment for Caz. O.K, I know it's not a card but I did make it and it is 'crafty'! As promised, here is my first crochet attempt (besides flowers) at making a . . .
That's all for now, will have my ATC up later. As mentioned in an earlier post WoJ is sponsoring the Stampin Out Alzheimer's event. (you will need to make a small donation before you can access the site) Different companies are running various challenges with lots of fab prizes on offer. I didn't have any square post its to hand (just some shaped ones) but remember seeing some cute mini post it note holders last year using book rings and it's been on my list of things to try so thought this was perfect time to make one. Mine's even easier as I've just made a cover to go over my heart shaped post it notes. I've just traced and cut out shape onto piece of scrap dp (this was thick like card but if you have paper just stick it onto card first)to make my cover then put them all together to cut a hole through it all with my cropodile. Then you just decorate your little cover before adding your book ring to finish. 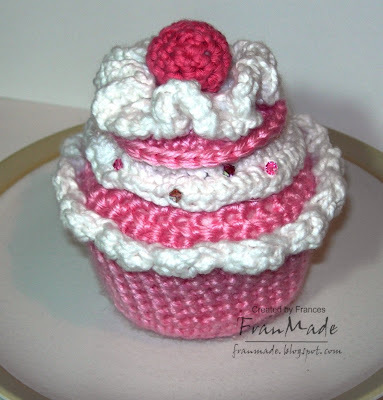 I've also been trying a bit of crochet for fun over the weekend and will show you my first attempt at something other than flowers (which is all I've done up to now) later, once I've taken a photo of it. Seeing as I missed the boat for last week's sketch (see post below this one) thought I'd get in early for this week's Sketch Sat! Although, even this one has been sitting on my desk all weekend as the weather's been too nice (for a change!) to stay inside and I've only just finished it now. This is another cutie from the Wild sprout range over at the Greeting farm (am hoping my order with the 2nd Miss Anya set will arrive tomorrow - should have been here Fri/sat but Postie is not behaving and is making me wait!). Not that happy with the kitty's colour and I added the 'make a wish' sentiment in the corner, right at the end as it looked a bit bare but I went and over squished it (why I prefer rubber to clear polymer stamps) so it's a bit blurry. However I'm not going to chuck it as at least with all it's imperfections you know it's a handcrafted card! Hope you've been enjoying the sunshine whilst it lasts as it looks like the rain is coming back again! I seem to be a day behind as this is the 2nd card I've made now that's missed the challenge by a day! Oh well, it gave me a fab layout to work with and I like the end result which is what is important. Fancied some softer colours after yesterday's bright one. 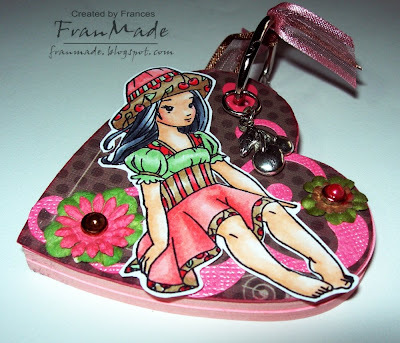 So this was using last week's Sketch Sat's layout which I love and another cutie from WoJ summer kit, which by the way will be available to buy individually online tomorrow (Sun 24th) here or probably later on tonight if you're up late enough in the UK. The grassy knoll she's sitting on is also WoJ from an earlier release. Love how you can mix n match them. 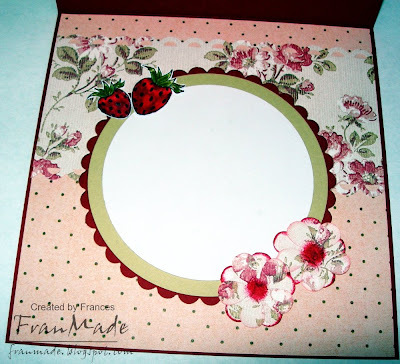 I used some of the cute extras from the kit (the strawberries) to add to the inside too. Usually don't bother but I wanted to use up the scraps and it was a nice easy layout to continue on the inside too. Also used some flowersoft for the first time (had it a while too!) on some of the flowers in the background as they looked like they should be fluffy to me (like the result but boy does that stuff expand and get everywhere!) and the strawberries have been given coat of glazed pen. Have a good weekend everyone and for those in the UK, enjoy the slightly longer Bank Holiday weekend! Hiya, just a quick post today. 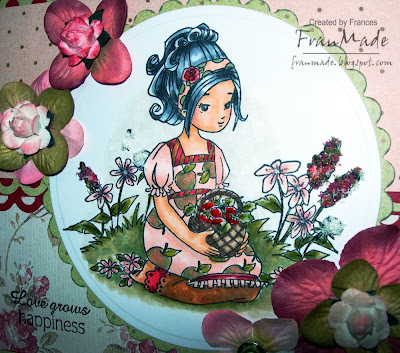 I made this card using Claudia's sketch over on Fri sketchers even though I'm too late now!However I have also used the colours over on Copics colour challenge and I think it's a fairly balanced card so will enter it for this week's ABC challenge too. Be warned, it's another bright one! 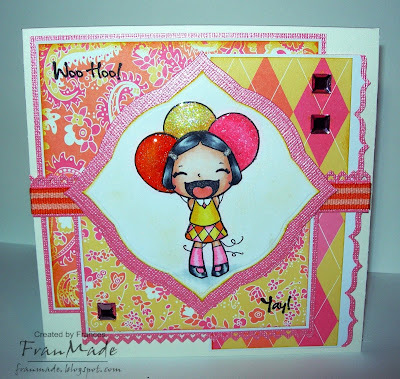 The paper (DCWV Citrus stack) just fitted the Copic colours perfectly and I just had to use this WoJ stamp (from the summer kit) as she reminds me of a spanish senorita and it all came together really quickly. The pom pom trim was just the perfect colour match and fitted the fun feel I wanted for the card. I see Blogger's playing up again as I'm having problems seeing/viewing some blogs. Hope you're having better luck and it sorts itself out soon. Will be posting a card tomorrow too so hopefully see you then. Morning! CCT this week wants a sporting theme and at first I was a bit stumped. Then realised I did have some just not what first crosses my mind when you say 'sports' (like fishing, skating, karate, dance etc) but didn't fancy using those or else my DT teamies had already used it. 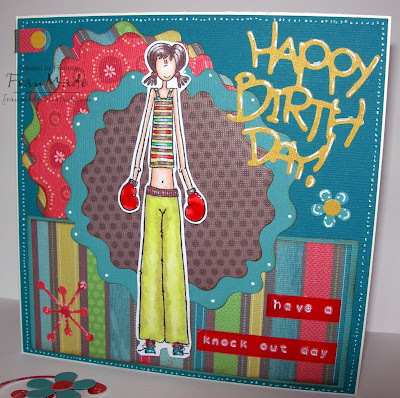 Then, after reading Nikki's post about taking part in the Scrapmagasinet challenge realised I had this fab little boxer Rakle stamp (stamps are from Norway and I've had them for over a year so must use them more!) and hey presto, I've killed 3 birds with 1 stone. 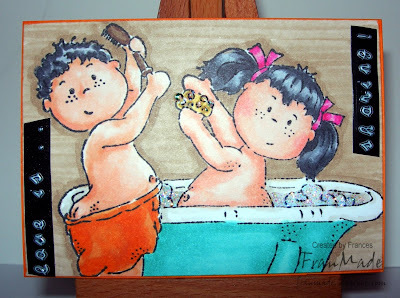 Image: 'Rakle Bokser' Scrapmagasinet stamp (store in my sidebar). Others: 'Peony' Nesties (thought they looked like a 'POW' shape IYKWIM to go with the boxing theme? 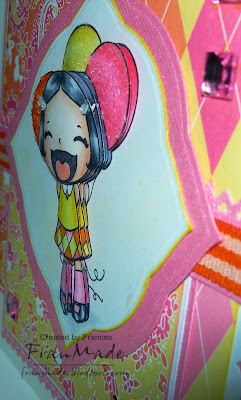 ), Sizzlet happy birthday die and sparkle die, ATB tapewriter and white gel pen doodles around edges. 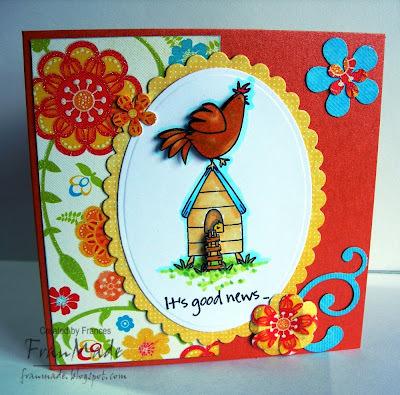 I'm off to see what's over at The Greeting Farm's monthly Farmer's market and what the lovely new Elzybells release are like, then off to do some more DT cards for WoJ and hopefully catch up with some blogs later. Oh, also need to find somewhere we (me & hubby) can go to for a 3night mini break next month (only time away/holiday we'll get - downside to being self employed). Nothing too far or expensive. Was thinking Paris (we've already done Barcelona, Amsterdam, Rome, Venice & Brussels). Or else somewhere in UK or Ireland. Any suggestions? Have a lovely Thursday. 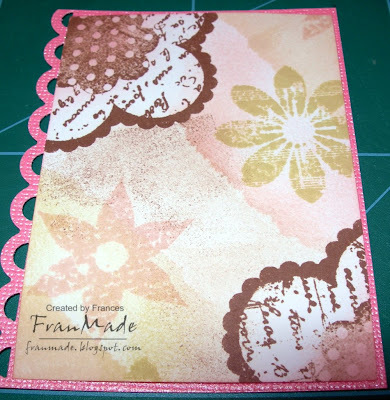 I just used some various flower stamps and distress inks to create my background. 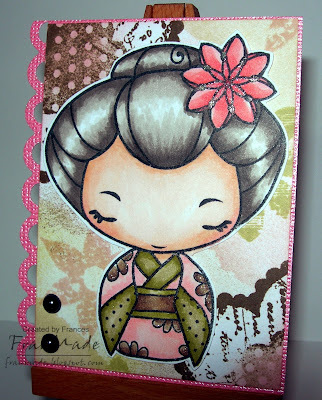 Then thought Geisha Anya looked pretty against it so just coloured her in with Copics to match with a little bit of Sakura clear stardust pen for added shimmer. Added scrap piece of pink cardstock to frame it all and 2 black pearls to finish. Anya kinda hides most of the background anyway but here it is before I stuck it all together. The flowers are from a Making Memories clear stamp set that caught my eye when I was in Hobbycraft the other month then I just sponged more distress ink all over by masking sections with a bit of torn paper. Time for a change. 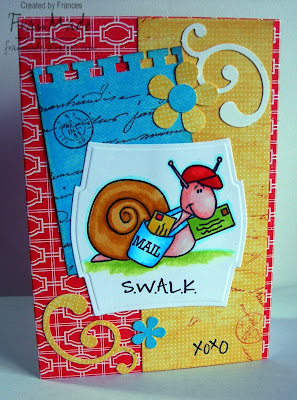 Something fresh, clean and bright for tonight using stamps from Toodles & Binks. I think these characters are just such fun so no fancy embellishments or too many layers. Even the colouring was nice and simple :) I find it's nice to mix it up a bit otherwise I get bored making the same style of cards and you'd get bored looking at them! Best go make my ATC for tomorrow, yikes running late as usual. Have a good evening. 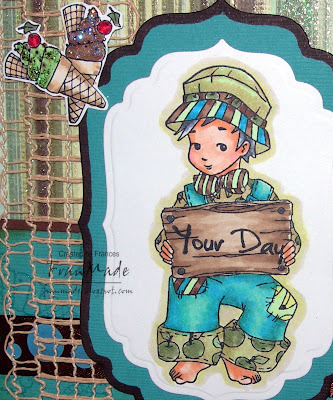 I've gone from yesterday's bright/modern card to a very muted/vintagey one today with another cutie from WOJ summer kit as she just screamed vintage to me (think it's the bloomers and the boots that does it). 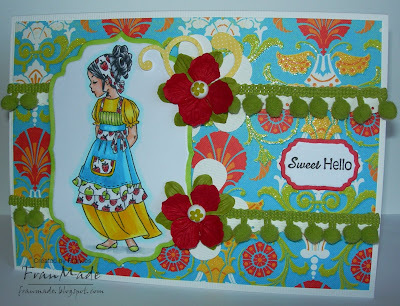 Again, my photo skills are useless and I can't pick up the shimmer in her dress or the dimension to the card as she is on foam pads and the flowers have been shaped - may see it better if you click on photos. That's all for today folks but please read below info about a worthwhile event that WoJ will be sponsoring. Whiff of Joy will be sponsoring the charitable event called SOA* (see details below). Our event coordinator Jacqui will host a challenge with the chance to win a great prize. Please visit Papercraft planet for further information. 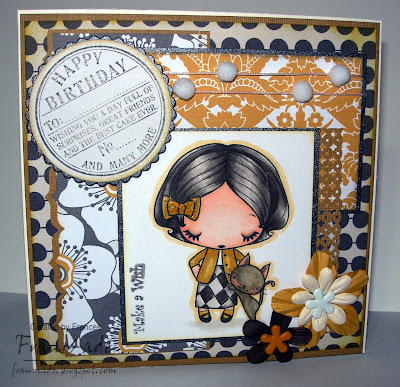 please pop along to papercraft planet and listen to Susanna’s video..
Just magnolia - 365 days worth!